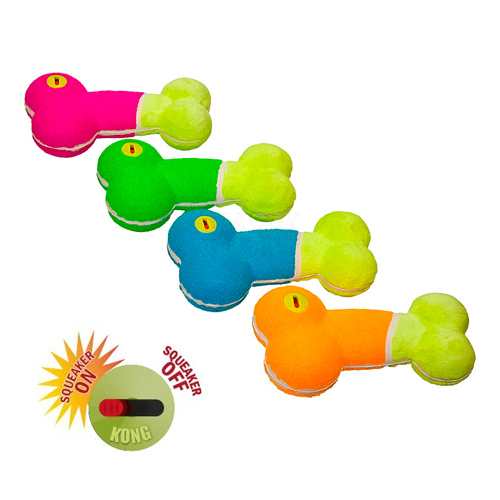 The KONG Squeaker Bone Off/On is a dog toy with a twist; the squeaker can be turned on and off. The toy is made of AirDog material, know from other KONG toys. Our entire KONG range can be found here. Made from a non-abrasive material, so that it does not damage your dog's teeth. Turn the toy on to play with the squeaker, and turn it off for quiet play time. KONG Squeaker Bone is available in a large size (20 x 10.5 cm). Colour choice is not possible, this product is delivered at random in the following colours: orange, pink, blue or green. Have you used KONG Squeaker Bone Off/On before? Let us know what you think about this product.